‘ders mud in dem der hills’. Like lots of it. It’s every four-year old boy and two-year old girls dream. Today we spent three hours building rivers and digging lakes. The kids hiked all the way down to the bottom of ‘switch back’ mountain and all the way to the top. They were absolutely COVERED with mud…head to toe. It was amazing. I wasn’t much better actually, Emily required the occasional ‘carry’. I can hardly wait to discover what is under all this snow and to explore all this place has to offer with my kids. Today…despite the mess…was long anticipated and enjoyed (though…I really need to track down a collection of splash suits and may need one for myself). 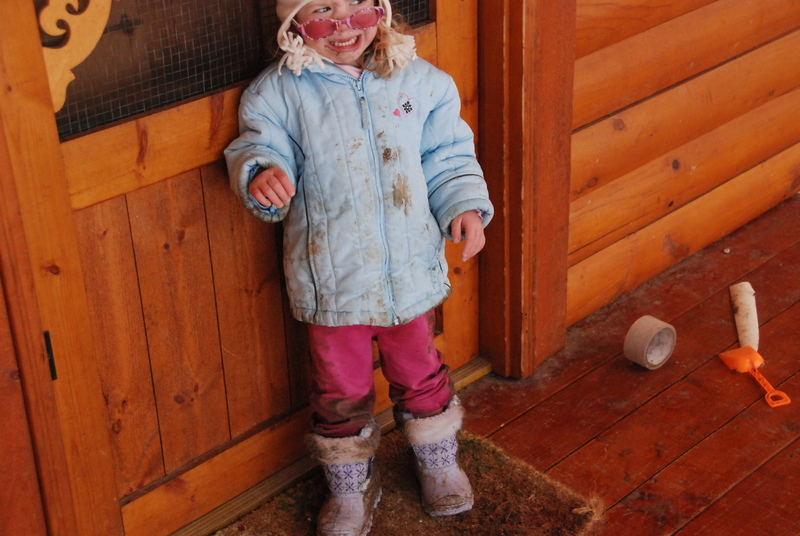 If you have kids who like mud or rivers of water, come for a visit…bring a change of clothes. We started our nature table today and I am on the prowl for a British Columbia plant identifier…anyone have one they aren’t using??? Happy trails this weekend friends! Hope your path is less muddy than mine. Well unless you have a four-year boy and a two-year old girl. Then I hope you have plenty of mud. So cute!! What a great mommy to let the children be children and enjoy mud play!! Thanks for visiting my tiny blog world, your comment was very sweet and encouraging!